John Riccitiello, the man at the top of publisher EA, has long stressed that "quality" is paramount under his reign at the company. But the CEO who normally loves to promote high Metacritic scores is also fine with "pretty good." Asked yesterday about the review scores of the recently launched Medal of Honor—which is enjoying a pretty decent 75 out of 100 average on Metacritic—Riccitiello weighed in on the game's reviews and how the mass market, not the "core game reviewer," responded. "First off, the game is rated mid-70s, almost 20 ratings rated 90 or above," Riccitiello said. "So as an observation, mid-70s is generally perceived to be pretty good. I think, ultimately, what happened there and pretty much as we'd expected, the game appeals really well to a mass market, your average gamer." "There is a small minority of folks, sometimes well represented by core gamer reviewers or game magazine reviewers, where best I can tell there's been 80 or 90 hours a week playing first-person shooters," he continued. "They are very core to that segment, and some of them didn't like the title." I don't know who spends 80 or 90 hours a week playing a first-person shooter, but if they do, they probably have very very very specific tastes. 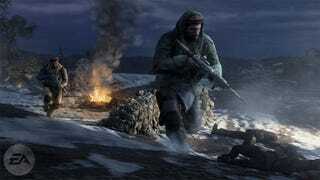 EA says Medal of Honor, despite selling at a healthy pace so far, didn't meet its own quality expectations. So How&apos;s Medal Of Honor Sold?